NC Maker questions and answers. Q&A->How to make new postprocessor. Easiest way to make new postprocessor is to use prototype CNC program. The CNC program should contain all necessary codes: marking and cutting sequence, text printing commands, if it will be used in new postprocessor. Better if CNC contain also inner and outer contours of cutting sequence. and open File->Options ESSI, if the example of ESSI codes. Example file name – 851501.mpg. NC Maker collect ESSI codes for new postprocessor into codes table. What is necessary to do in most simple case is to give a new postprocessor name instead of text "Unknown format ESSI" and save it. After that new postprocessor will be available in converting menu. $EKWI2$ - cutting allowance in 0.01 mm. NC Maker is simple and powerful CNC programming tool for cutting machines. 1. Import DXF file with parts layout and converting them into any CNC cutting program. 2. Read, check any modify any types of CNC program. 3. Automatically create new postprocessor based on cutting program example. 4. Converting CNC files one type into another. 5. Auto routing function for marking and cutting sequence. 6. Powerful tools for manual editing of cutting programs. 7. Step by step cutting sequence simulator. 1. NC program step scale factor. 2. On/Off text information on nesting layout. 3. On/Off part's edges with beveling. 4. On/Off inner contours detection during importing DXF files. 6. On/Off gray coloring of the parts inner space. 7. On/Off marking lines collision control. 8. On/Off insert mode for NC editing. 10. The path to an open file. File - contain all necessary commands and options for file operations, converting and etc. 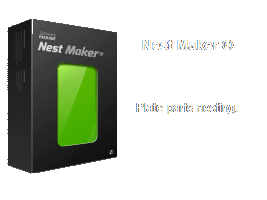 Nests group (GSR) – file from Nest Maker software contains nesting layouts for one thickness and material quality. DXF (NC) – DXF file contains a NC marking and cutting sequence. DXF (Nest) – DXF file contains a parts layout (just plate parts). Different ESSI and EIA CNC programs can be recognized by choosing suitable converter from the converters list. Note! Only one GSR file can be loaded at same time, but several DXF or CNC files can be selected and processed at same time. Nests group (GSR) – file can be saved as GSR. If DXF or CNC converter selected - only current nest will be saved into corresponding file format. DXF or CNC - file file can be saved like DXF or converted by selected CNC converter. Data about cutting process. Cutting length - 47.51m, rapid traverse 12.54m and 5 piercings. Data about powder marking process. Marking length - 17.78m, rapid traverse 12.45m and totally 16 lines. Scrap ratio, parts weight and plate weight enclosed in brackets. Scale of printed cutting map. All nests in GSR or all loaded files will be converted and saved into selected file format. By this command user can join one more CNC programs described in different file formats. After selecting CNC file for insertion, user can select insertion point, begin of cutting point, necessary shifts on inserted CNC program and also rotation. This command will generate CNC programs for all GSR files in current working folder. Usually it used for generation of all CNC for one building block or unit. This command will generate DXF NC sketches for all GSR files in current working folder. Usually it used for generation of all DXF sketches for one building block or unit. Files *.format contains converter description commands. By loading this files user will get new postprocessor for converting files or generation new NC. This option provides exchange possibility between different customers. Black – rapid traverse and other codes. User can change type of postprocessor for visualization, switch between absolute an relative coordinates of NC. Selected string in text window will be shown in graphics window by green arrow. By moving up and down cursor in text window user can simulate cutting sequence in graphics window. This tool has possibilities similar to Code editor, but the difference is – viewer text window shows original codes of opened NC file, and you cannot edit them in this mode. Colors and signs are the same as for Code editor. Reports command create all necessary reports for cutting process on the Yard. By this command user can measure distances on the nest. It gives - total distance (S) and distances in X (dX) and Y (dY) axis between two points. Points for measuring have to be on line or on the edge of plate. NC maker will snap to the nearest vertex or point on line. If vertex is selected, it will be marked by blue circle “o”, and if just a point on line it will be marked by blue “x”. Parameters like material type, kerf compensation, density and cutting speed can be modified by Material command. Dialog Options contain most of important settings for NC Maker. Tab Screen responsible for the presentation of different information on the main window. On/Off % Preview on selection - show previews of NC when file open dialog. Additionally there is several possibilities to change font and color for text on NC. Tab Save responsible for setting before saving NC programs. On/Off Correction NC - run correction dialog to set up some specific NC parameters. Previous parameters from postprocessor will be ignored. User can also defined additional shift by X & Y from selected cutting tool position. Tab DXF responsible DXF import/export setting. Contain setting for correct reading NC or Nest from DXF. In list user can choose Layer with plate geometry description. Accuracy determinate DXF approximation precision in 1/1000 mm value (1-20000). By choosing Layer in External box user defined default parts outer contour. By choosing Layer in Internal box user defined default inner contour. Marking box is responsible for Layer with marking information. Contain setting for export NC programs and sketches into DXF. On/Off Picture - output sketch with more readable text. in boxes user can define own layer name for inner, outer, marking and plate information. Deleted fragments can be also exported to DXF in separated layers. On/Off List - output sketch in scale 1:1 with rapid traverse statistics. On/Off Shifts - output inlet/outlets into DXF sketch. Tab Path responsible for new route definition settings. User can define inlet/outlet geometry for outer contour and inner contours separately. All dimensions in mm, angles in grad. On/Off With cutt. - user can choose if necessary to move from part to another with cutting tools switch on. On/Off Cutting at first - user can choose if necessary to start cutting before marking. On/Off Auto - automatically making rout for inner contours when outer contour for part defined. Options ESSI responsible for ESSI settings of the current postprocessor. - list of available extension for reading ESSI files. command. Another words only active postprocessors will appear in list when user save program. List of available postprocessors. When user choose postprocessor from the list, all settings will be updated in accordingly. Button Sort - sort of postprocessors list. Button Save - save new postprocessor into ".format" file. Button Delete - delete current selected postprocessor from list. Cutting process codes - contain all necessary definition for coding cutting sequence of CNC ESSI. 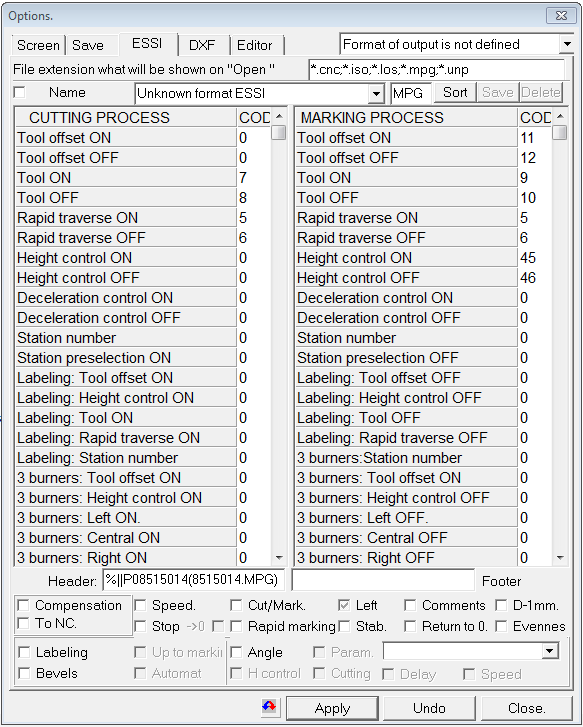 Marking process codes - contain all necessary definition for coding marking sequence of CNC ESSI. Header - additional information in begin of CNC file. Footer - additional information in end of CNC file. On/Off Compensation - allow programs calculation of the kerf compensation. On/Off To NC - allow kerf compensation definition by ESSI commands. On/Off Speed - include control cutting speed commands. On/Off Cut/Mark - allow mix in CNC cutting and marking sequences. On/Off Left - allow kerf compensation from left or right. If it's a gray color - not control. On/Off Comments - add CNC file information into CNC header. On/Off D-1mm - make NC discrete step 1 mm. On/Off Stop - Stop command after marking. On/Off Rapid marking - marking on rapid speed. On/Off Stab. - marking lines high stabilization function. On/Off Return to zero - move cutting tool to initial position after cutting is finished. On/Off Evenness - add checksum for major byte ( used for paper type only ). On/Off Labeling - allow printing text information by NC program. On/Off Up to marking - all printing commands will be located in NC before marking. Available only if "Labeling" is "On". On/Off Angle - add high stabilization command before corner. On/Off Param - if "On" beveling parameters will be set before corner loop if "Off" after corner loop. Special description file for current postprocessor (.SV) can be selected additionally. On/Off Bevels - allow generate program with beveling information. In list of files (.bvl) user have to choose one of three cutting tools. On/Off Automat - add to CNC commands (120, 121, 122, 123 ) for control of angles and hihts of left and right cutting tools. On/Off H-control - use high stabilization command before loops. On/Off Cutting - use three cutting tools. if "On" beveling parameters will be set before corner loop if "Off" after corner loop. On/Off Delay - delay for switch on and rotation of the cutting tool. On/Off Speed - reduce speed before loop for switch on and rotation of the cutting tool. Button Apply - save all changes in the postprocessor. Buttons Undo or Close - keep the settings without changes. Options EIA responsible for EIA settings of the current postprocessor. On/Off Stop - Stop command after marking with or without moving into 0 position. On/Off Left - allow kerf compensation from left or right. If it's a gray color - not controlled. On/Off Decimal - allow to use floating point format values in program. On/Off In absolute - allow to use absolute or relative coordinates. On/Off No numbering - disable string numeration in NC program. On/Off Discreet - allow to use discreet step values in program. On/Off Top corner - start program from top left corner. On/Off Short - allow to use short command notation. On/Off XY - allow to set up number of digits for coordinates. All additional parameters can be added into (.sv) file and selected for current postprocessor. Button Apply - save all changes in the postprocessor. This command will set default options in according of the current project settings. This command will calculate statistic information for current CNC program. If several NC files loaded user can "On" Table and save statistics information for all loaded NC into file with extension (.sta). This command will show dialog for checking NC file. On/Off Closed - checking for not closed contours. On/Off Intersection - checking for intersections of cutting lines. On/Off Sequence - checking for mixing cutting and marking sequence. On/Off Kerf direction - checking for wrong kerf compensation direction. On/Off Cutting direction - checking for wrong cutting direction. On/Off Min lead in angle - checking for wrong lead in angle. On/Off Half kerf of cutting - checking for half kerf cutting when common cutting used. On/Off No small overlaps - checking for small intersections. On/Off No on parts - checking for piercings inside parts. On/Off No on contour - checking for wrong piercings on contour of parts. On/Off Min distance - checking for distance between piercing and contour. Check can be done for one NC or for all loaded at this moment. All detected problems will appear in resulting list. For visualization of detected errors it necessary click button "Show" or double click on selected string. Button "Window" show zoom into area where problem detected. At this moment NC Maker available on English and Russian languages. All command for manual or auto routing collected in this menu. Undoing previous editing operation. NC Maker has unlimited undo operations. This command is used for start cutting sequence with in-let by tangent line to part contour. User need to click on part's point and select cutting direction. For not closed contours only end points used. This command is used for contours node points. 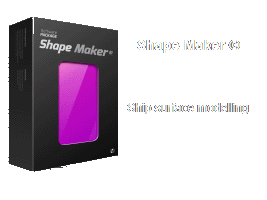 User need to click on part's node point and select cutting direction. This command is used for contours edges. User need to click on part's edge and select cutting direction. It can be used for cutting and marking. This command is used for making bridge to scrap material to hold small parts position on the cutting table. User need to click on part's edge and select cutting direction. This command is used for making piercing exactly in middle of two node points. User need to click on part's edge and select cutting direction. This command provide inserting piercing in any place on gross plate. After inserting first point, cutting mode will switched on and user can make cutting sequence. If insertion mode is on user can click on rapid traverse line and make new piercing point. This command provides inserting any configuration of the cutting polyline segment. If endpoint of such segment comes to part contour, it is necessary to select direction of cutting. If insertion mode is on, cutting segment will start immediately after selection of rapid traverse line. Double click on rapid traverse line convert the line to cutting segment. Bridges menu item collect all available operations with bridges. Bridges is most common technique for cutting correctly small parts. If part with no cutting route located close to another one with route, it's enough just click on space between two parts to make bridge. It is also possible to make a several bridges between two parts. Long bridge command create bridges between all parts crossing by defined line. By clicking following tool bar user can choose inclined line, vertical or horizontal. Beginning point of this line should start from existing cutting sequence. Bridges between parts will be generated in according with cutting parameters settings. To delete bridge between two parts user need to click inside bridge body. To delete bridge between two parts user need to click inside bridge body. This command similar to Delete bridge, but additionally delete all cutting sequence after bridge. This command will delete all bridges in the current nest. Scrap-ties menu item collect all available operations with scrap-ties. It's used to fix position of long parts on the cutting table. long and thin parts, can be easily deformed by hitting during cutting process. Only scrap-ties can help to hold correct geometry for such plate parts. 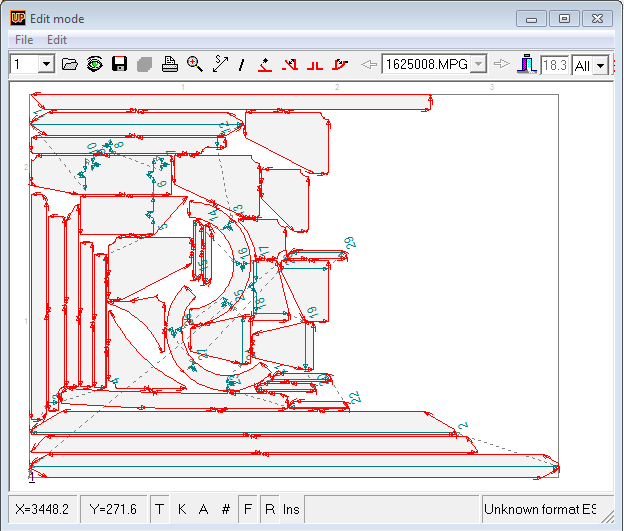 By this command user can add several scrap-ties on the cutting contour by equal distance. User need to select begin and end points on the contour. Distance between scrap-ties defined in File->Options->Path. This command works similar to Path->Bridges->Long bridge. User need to define begin and end points for line. All parts crossed by this line will have scrap-ties. User need to define begin and end points for vertical line. All parts crossed by this line will have scrap-ties. User need to define begin and end points for horizontal line. All parts crossed by this line will have scrap-ties. Delete scrap-ties by clicking on it. Delete all scrap-ties on current nest. Common cutting command let user to make common cut line for parts joined by straight edges. Before that part should be joined together by special commands in nesting software. To make common cot line is necessary to click on part edge just before common area. This part will be cutted first. Second part will be shifted on half kerf distance from first one. CNC programs with beveling information can be generated only in ESSI file format. To use EIA codes please use converting facilities from your cutting equipment software. Beveling settings can be different for different type of cutting heals. Field with plate thickness available only for imported DXF files without thickness information. Most of settings are same as for one cutting head. On/Off Windows - control process definition of windows on plate for setup and start burning of cutting heads. Blue color areas show places where windows can be cut for manual settings of the cutting parameters. Route for cutting all windows can be set up for all together of add and delete one by one. Buttons One and All is used for make route for all windows or one by one. Button Delete for deleting all windows routes. By this command user can add text labels for printing into CNC code. Normal letter generator - inset printing text commands into CNC code. UPEditor.fnt - insert text into CNC as marking lines. Button Write all - write all text commands into CNC. Button To optimize - run optimization of rapid traverse movement. Button Delete all - delete all texts. On/OFF Together with marking if it's On commands for buttons All write, To optimize, Delete all expand to marking lines also. On/OFF Add - all text commands will be added it end of NC file. NC - text will be added to CNC program only. Part - text will be added as text on plate part ( if GSR file open only ). User can change position and geometry of early defined piercing point. After selecting existing piercing point settings window will appear on the screen for changing piercing geometry, if it necessary, then select new piercing position. Marking, cutting and text printing sequence in CNCN program can be changed by this command. First cutting or marking line should be selected, then necessary select new codes sequence. By this command cutting direction can be changed for part or group of parts connected by bridges. if will affect outer contour and inner contours. By this command user can delete fragment of the cutting sequence between two node points. By this command user can change LeadIN LeadOut for different elements of NC program. This parameters can be changed for cutouts, outer contours, bridges, common cuts or for all elements together. This command used for making route automatically for current nest or for group of nests. Button To execute - run routing process. Automatically make marking sequence for current layout. Delete all previous defined CNC codes. and keep only parts geometry. Printing sketch for the photo-copying cutting. Run nest editor for current layout. NC Maker release and development history. 10.02.16 Auto route with beveling information implemented. 10.02.16 Extended EIA commands support added. 12.06.15 Nesting sketch template improved for part's list output. 16.05.15 New EIA postprocessor for Microstep cutting machine implemented. 10.03.15 Auto route with bridges between small parts only implemented. 18.02.15 Nesting sketches layers and colors for DXF file improved. 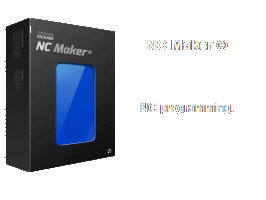 10.04.14 NC Maker new release now available. 15.03.14 User settings synchronization for project. 10.03.14 Self cutting bridges implemented for auto route function. 19.09.13 Inlet/outlet settings separated for inner and outer contours. 20.06.13 Changing cutting start point position implemented. 28.03.13 NC Maker new release now available. 10.02.13 Auto route function improved. 01.02.13 Auto route for all nests with the same thickness implemented.